Chanel Allure EDP can give extraordinary charm and sexuality. Chanel Allure EDP for women 100ml. is a floral-fresh smell for women. Are you looking for something unique? Add-on worthy of the real lady? This unique spark gives you the Allure perfume from the luxurious French brand Chanel. She will enchant you with her sensuality and make sure every woman who suits his spell will be self-confident. The sweet aroma of May Rose and Vanilla, combined with the fresh tones of citrus and the charms of jasmine and magnolia, creates an unrepeatable sensation for you and your surroundings. Sensuality and self-esteem, these are the main essences of exceptional Chanel Allure Eau de Toilette. Originality and nature guarantee an unforgettable experience even for very demanding women. Take temptation and cover yourself with a unique scent. 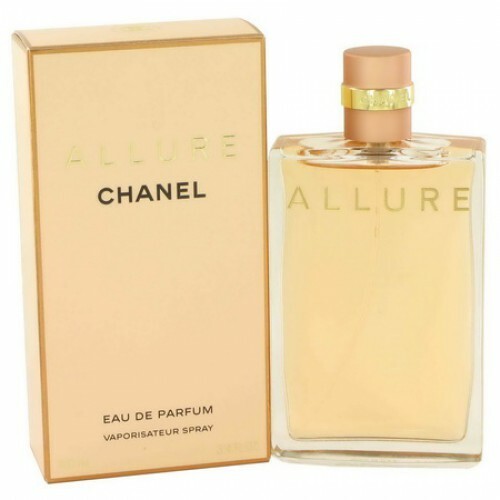 The smell of Chanel Allure, which gives you a sense of self-esteem, sensuality and originality, is another of Chanel's world-renowned products of world-famous brands. The flower fragrance Allure is a beautiful sensual composition that fascinates everyone with its magic. As soon as a few drops of perfume gets on the skin, you immediately feel lemon and Bourbon sweet vanilla. Beautiful, exquisite and delicate aroma. After a while, he gradually turns into vetiver, flowers of passionflower and mandarin. Perfume plays with you, it is constantly changing, by the end of the day around you there will be a few floral fragrances, it will be a peony, a May rose and jasmine. The fragrance of Allure combines the most exquisite oriental shades. He drives men mad, does not leave indifferent, intoxicates his beauty. Perfume Allure from the legendary house Chanel will be your favorite evening dress. This fragrance is created specifically for women to admire all around them.